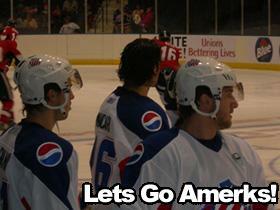 Two Game Weekend, The Calm Before The Storm · Let's Go Amerks! Â This weekend, the Rochester Americans will be hosting two teams at the Blue Cross Arena.Â The first game is on Friday against the divisional leaders the Toronto Marlies. This game is the second meeting between the Amerks and the Marlies.Â In the first meeting on October 6th, theÂ Amerks were outplayed by the MarliesÂ in a 4-1 defeat on the road.Â The Marlies are currently in first place in the North Division and second in the Western Conference. Expect the Amerks to be as ready as they can be against this divisional rival with the return of both of their captains and other key players from injuries and call-ups. Drew Larman, Kenndal McArdle and Mike Funk all returned on Friday after various injuries.Â Co-Captain Clarke MacArthur was returned to Rochester from the Buffalo Sabres on Saturday morning. Faceoff on Friday is at 7:35pm.Â Â The gameÂ will be broadcast live on Hot Talk 1280 WHTK, whtk.com and B2 networks.Â The game can also be seen live on Time Warner SportsNet Channel 26 in Rochester. The second game of the weekend will be on Sunday against the Binghamton Senators.Â In the last game against the Senators, the Amerks faltered and lost 1-4 in Binghamton. This weekend is the easiest thing that will happen to the Rochester Americans this month.Â Starting on December 13th, the Amerks will be playing ten games in 17 days with a packed schedule for every weekend and during every week. Next weekend the Amerks will be traveling from Rochester to Chicago, to Rockford, to Perioa back to Rochester from Friday to Sunday.Â Only three days later on Wednesday the 19th the team travels to Albany.Â They are back in Rochester on the 21st against the Toronto Marlies and then immediately off again to Binghamton for a game there the next day. Lucky for them, the team has three days off for Christmas.Â But, they will have to be working hard because on the 26th the Amerks once again host the Marlies for the thrid time in December.Â They then have another three games in three days that weekend.Â It starts with a home game against theÂ Hamilton Bulldogs on Friday, then they travel to Cleveland for a game against the Lake Erie Monsters on Saturday.Â That weekend is rounded off with another home game on Sunday against the hated Syracuse Crunch. There is no drought of games to go to this holiday season.